Sony is one of the largest exhibitors at E3 in its role as both manufacturer of the PlayStation hardware platform and as a publisher of games through its studios. 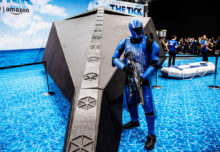 Keeping in mind that the central feature of most E3 booths are game-play stations, Sony upped the ante with a huge theater that produced content to cater to the industry audience while simultaneously serving as a platform for content that was broadcasted outside of the booth. The theater stage was nearly 200 feet long and included massive screens that played host to live content. The booth design incorporated large-scale photo marquis displays of key game titles, which were mirrored on their backsides creating the impression of an even larger space (Agency: Pinnacle Exhibits). Off the show floor Sony also offered an outdoor space with a baseball themed bar and batting cage to tie in to the baseball gaming title “The Show,” as well as a large PlayStation merchandise store for consumers. These outdoor spaces were a savvy overflow space for consumers while they were waiting to enter the show; consumer passes were limited to a narrower window of hours than industry passes. At E3, Sony serves as both manufacturer of the PlayStation hardware platform and as a publisher of games through its studios. There seemed to be a lot of zombies wandering around the show. If attendees weren’t scared by simply looking at them (they were pretty darn scary-looking), they could get up close and personal with one in the Capcom booth and its experience for Resident Evil 2. In this experience, attendees climbed inside a police cruiser for a photo op with a zombie. Attendees would get comfortable in the driver’s seat and then, while posing for their photo, a zombie would climb over the back-seat and scare them, leading to some extreme screams from the booth. Fun stuff. 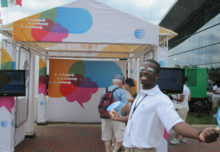 (Agencies: Kenwood Experiences; Exhibit Design: Pinnacle Exhibits). 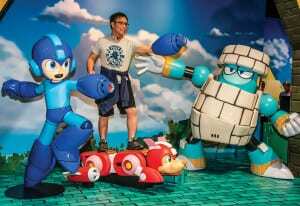 E3 offers many photo experiences, most of them were simple photo ops with game characters. Marvel’s Spider-Man took the experience to new heights with a two-story mirror reflecting a graphic of a building from the floor. Attendees were invited to pose on the graphic as the mirror made it look like they were scaling the side of the building. Small groups of fans appeared to be jumping or sprinting up the side of the building like Spider-Man himself. The large mirror served as a powerful attention getter and foot traffic generator and attendees seemed to have fun trying to pose themselves in their best Spidey poses. The fun factor here was high and the experience was a must-share on social media. 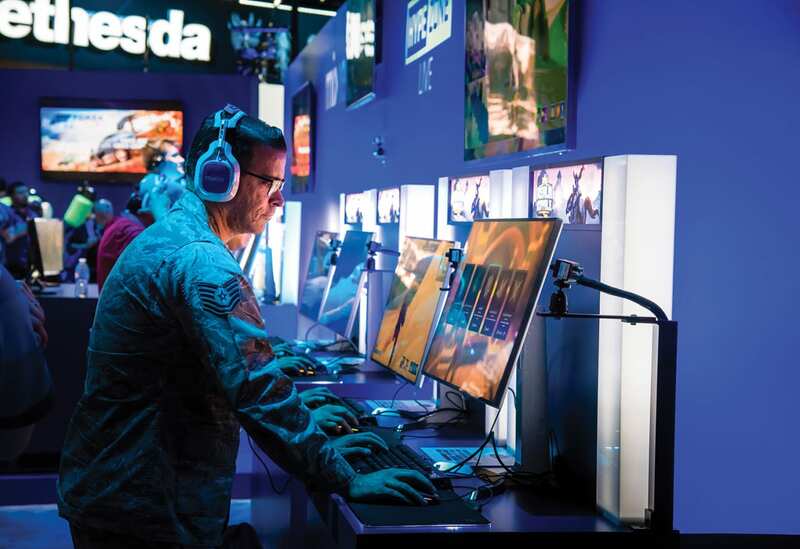 Going back a few years, Electronic Arts already wanted more of a consumer focus than E3 was providing so it created its own consumer-focused companion event adjacent to E3. 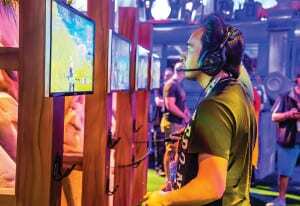 Dubbed “EA Play,” the fan experience still provides acres of games and fan experiences directly to consumers at the Hollywood Palladium and its surrounding (but transformed) parking lots. Thousands of consumers lined up this year to play previews of upcoming games before they were available for general release. 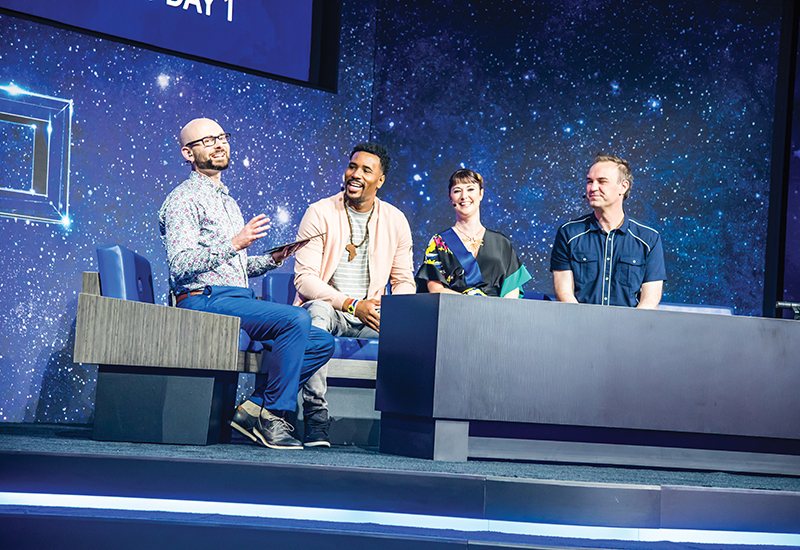 The event also featured a large press conference from the “Creators Cave” area and a large new stage for events and competitions. 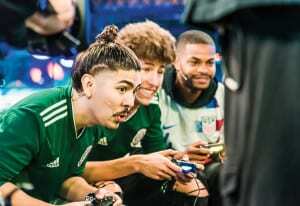 Dozens of popular players, dubbed “Game Changers” by EA, mingled with fans in a variety of areas themed around their popular titles that include FIFA, Madden, Star Wars Battlefront, The Sims and the upcoming Anthem (Agency: Plumbago Productions). Volkswagen produced a small consumer experience in the E3 lobby featuring a car being hand painted by artists with video game artwork. It also included a consumer activity in which attendees stepped inside a mirrored booth to experience a new colored ambient lighting concept found in the automaker’s cars. Although the latter was somewhat interesting, it seemed disconnected from the show and not something that gamers might be likely to spend their time doing when they put such a priority on playing games. The brand ambassadors asked us to take a survey about the experience that included questions such as “did the connection to gaming enhance your opinion of Volkswagen?” We asked them what the connection to gaming was and they answered, “just being here at E3.” Our opinion: it takes more than that to make a real connection with an enthusiastic audience, especially in a show crammed with great audience-centric experiences like E3. As another of the major platform manufacturers and game publishers, Nintendo has a historically strong connection with gamers. What we loved about the Nintendo experience at E3 was how enveloping the brand was in all aspects of the experience. 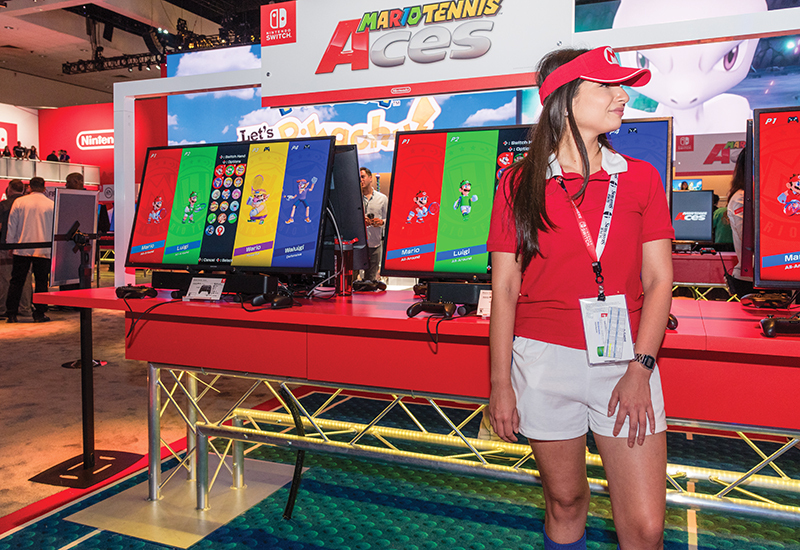 From brand ambassadors dressed in clothing that perfectly complimented the brand, to displays of props from Mario, SuperSmash Bros. and other games, to a large stage for streamed tournaments Nintendo brought their brand to life in a classic and stylish way. Nintendo brought a classic Nintendo presence to E3 with bright, primary colors and coordinating brand ambassadors.